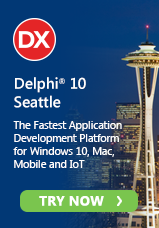 Just a reminder that this is the final day for the December 2013 special offers on RAD Studio, Delphi and C++Builder XE5. If you need to buy after hours, you can buy from our online store. InfoPower VCL will be delivered by email within a few minutes of your purchase and will not be delivered for any purchases made after the offer ends. To get your free InterBase Server license (with purchases of Enterprise edition or above), you must install and register your XE5 product and go to the redemption page by January 14 to get your InterBase license and download. To get your free FM Style Pack, Mida Converter, InfoPower FM and Coding in Delphi book, install and register your XE5 product and go to the RAD Studio users download page to access your free items. Be sure to download them by January 14. If you purchased an upgrade from version 2009 or earlier during the upgrade promo period then be sure to install and register your product within 14 days of purchase.